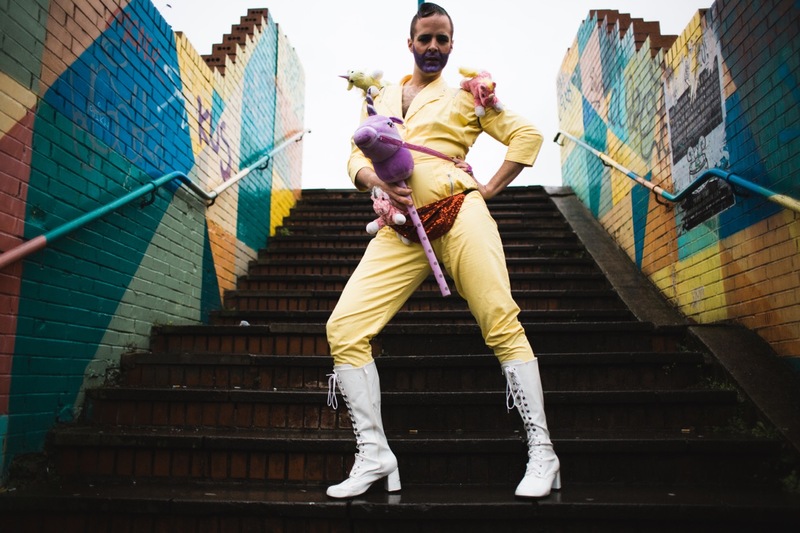 We spent some time this week shooting the breeze with hula hooper, performer, lover of glitter and number #1 boylesque performer in Rhiwbina, Ernie Sparkles. Cardiff born and bred, Ernie – aka Gareth Pahl – tells us about growing up in Cardiff, his love of performance and explores a little of the cultural offerings of the city today. Take it away, Ernie! I was born and raised in this wonderful city of Cardiff a long time ago! Well, 34 years ago, back in the days when Cardiff Bay was full of mud you could throw stones in and make epic splat noises – God that was fun! Being the son of a builder we were lucky enough to get a great deal on a run-down house in Rhiwbina when I was young, just around the corner from the old Monaco cinema. It was a relatively quiet street with lots of young families so we spent a lot of time playing on the street on our bikes, roller-skates, go karts, whatever as long as it had wheels! We used to play insane games – one of us would have a stick tied to a rope, the others had to cycle around. The game was to throw them off their bike by sticking the stick through their spokes as they cycled past! Growing up was awesome, I was lucky, I had a good family, good friends. My wonderful Nan would spoil me and my brothers by taking us to the circus, the Monaco cinema, the theatre and then we’d spoil her back by making her watch us re-enact the whole thing when we got home! Mum and Dad worked as hard as they could to raise three boys and keep a roof over our heads (although I remember one winter when the roof was off the house because dad was building a loft extension – the tarpaulin would be flapping away above us). Cardiff as a city in my childhood was a lot different to now. Town and Cardiff Bay wasn’t as it is now. It’s a shame we lost things like David Morgan’s department store when it all changed, but I think Cardiff is a better place now. We’ve been lucky to receive the investment to make the city as it is now, and it does worry me a little about the future after the weird political shifts of 2016. I was born at the University Hospital in Heath, and lived in Roath for a year or so before moving to a house in Llanederyn where I lived until the age of five. Then we moved to Rhiwbina to be closer to both sets of grandparents and a bigger house. I don’t really remember much before moving to Rhiwbina. I spent most of my life here in Rhiwbina and this is where I live now (in my wonderful Nan’s house, although unfortunately she’s no longer with us). At the age of 18 I moved to a farm in Rudry for six months or so, I was helping to put a roof on a historical barn that had its roof blown off in the great storm 1987 (if I remember right). I then moved back to Cardiff and lived in Gabalfa for a year before deciding to move to London in 2003. I lived in Wimbledon for 3 years whilst I did my degree and then bought a house in Rochester with my partner at the time. We lived there for seven years before I moved back to Cardiff. When I was five, my Mum and Nan bought me tickets to go and see Les Miserables in London. I already knew all the words because we had the soundtrack at home. I was utterly captivated and mesmerised by the show, and on seeing the barricades I knew that I wanted to be a barricade maker. I wanted to be the man who makes the magic that goes on the stage. I spent the rest of my childhood and teenage years watching every single show, studying set and costume design, and just being totally obsessed with theatre. If I wasn’t going to be a designer I was going to be a director, it was one or the other – but really, I wanted to be a designer. Santa bought me a toy theatre – it was run on magnets and it was magical! I used to make sets and characters for it and I’d put on every single show ever made haha! I bet Nan could’ve killed Santa as I made her watch them – she’d have a ticket, she’d have a programme, she’d have to come and watch these epic shows. In 2003 I was accepted onto the BA(Hons) Theatre Design course at Wimbledon School of Art and there began my adventure into the real world of Theatre Design. I should’ve used this time a bit better to be honest – I did get seduced by the lifestyle of London and so sometimes I wasn’t as focussed as I should have been! But hey, I graduated in 2006 and then never stepped foot in a theatre for about six years – I had a mortgage to pay! In terms of my careers, lord, what jobs haven’t I done! I’ve been a cleaner, a burger flipper, a carer, a builder, a theatre usher. I was a finance officer at Mencap Cymru for a couple of years before I moved to London, and in London I worked for Seasons Florists in Wimbledon – I loved that job! We made amazing floral displays including Venus Williams’ winner’s bouquet at Wimbledon Championships. When I moved to Kent I was a finance administrator for Age Concern and later finance manager for Medway Cyrenians – a homeless charity. I loved those jobs too – they were interesting and I’d meet some wonderful people. In 2011 I then trained as a Primary Teacher at Canterbury Christ Church University. At that time, I also used to teach performance workshops, and do a bit of set and costume design here and there. I ran an annual carnival with local communities and produced various events. I moved back to Cardiff in 2012 where I worked as a primary teacher for several years until 2016 when I decided I had had enough and needed to go back to my love – theatre. I now work as a freelance set and costume designer, model maker, performance artist, director and choreographer at Sparkles Hoop Troupe and Scratch This producer. I do a bit of everything really and I always love it that way! In 2014 I became quite poorly after a child sneezed into my eye! I was ill for so long after that and needed to get fit to get through it. I have always been rubbish at exercise and the gym so I needed to find something that would grab my attention. A friend recommended NoFit State circus community classes and I thought why not give it a go! I went to the aerial beginners’ class and have been hooked ever since! I started training in aerial hoop and static trapeze as well as my love – flying trapeze. I have been training for two years now and was starting to get good, but I haven’t trained for a couple of months now for various reasons, but I’m keen to start training again soon. Around about the same time I started learning to hula hoop with Elliecoptor Pilott at the Abacus. I was useless at it but determined to nail it so I practiced every day for months and months. Six months later me and Ellie set up Sparkles Hoop Troupe as a fun way of encouraging people to use the hoop skills they had been learning by putting them into group dance routines. It really took off and here we are two years later having had so many gigs and bookings! Last summer we were performing at festivals and events nearly every weekend from May until September! We are lucky to have such fun and dedicated ‘Sparklettes’. A lot of my time is now spent on managing Sparkles Hoop Troupe with Ellie. We’re a great team because she is great at managing the bookings and all the admin side, whereas I’m more creative so I make the costumes, edit the audio tracks, etc. We both take charge at directing and choreographing! We’ve taken off and now we’re starting to get professional bookings on the cabaret circuit which is great fun! Myself and Ellie have also started masterclasses in hoop choreography, we were recently in Bournemouth teaching and that was so much fun! I also produce a circus scratch night called Scratch This! The circus scene in Cardiff is expanding what with NoFit State and their community classes, but also companies like Mary Bijou etc. It’s great that this scene is expanding and we love to give opportunities to performers both professional and community based who want a performance platform to try out new ideas and get valuable friendly feedback. Our first three shows were well received and all sold out! We’re starting to get a good reputation as a good fun show to come and try out ideas in a supportive and relaxed environment. Our show on the 11 February was our best yet and we were so lucky to have had so many wonderful cast and crew involved. We have struck up a great working relationship with Cardiff Speaker Hire – the venue we use, they are great and we love working with them! Recently I have started following my interests in clown and have been on a few clowning courses. It’s been great fun and I’ve noticed big changes in my performances since. It’s something I want to do more of! I’ve been working with Alison John from Yello Brick and Hannah McPake from Gagglebabble setting up a regular play space where people can come and play games and mess around! You can find out more at Shakedown Cardiff or why not come and play on the 2 April at WMC! Now, let’s talk about Ernie Sparkles – bless him, that silly jumpsuit obsessed boy always on the hunt for unicorns and fabulousness! He came from planet glitter or something ridiculous like that! Again, like most things that happen to me – it happened by chance! He started off as a bit of silly fun for a friend’s wedding cabaret. Having seen Immodesty Blaize in London back in 2005 I have always had a silly fantasy about being a boylesque dancer! So, when a friend wanted a cabaret at her wedding party I put myself forward to do a silly routine under the name Mr Sparkles. That was the first ever showing of Ernie’s ‘Milkshake’ routine and now two years later its being booked by various cabarets around the country! Hilarious really! He grew from there really, he’s a bit like me in that he likes to keep his fingers in lots of pies! He’s obviously a regular at Sparkles Hoop Troupe and he compere’s Scratch This, he also has his boylesque routines. 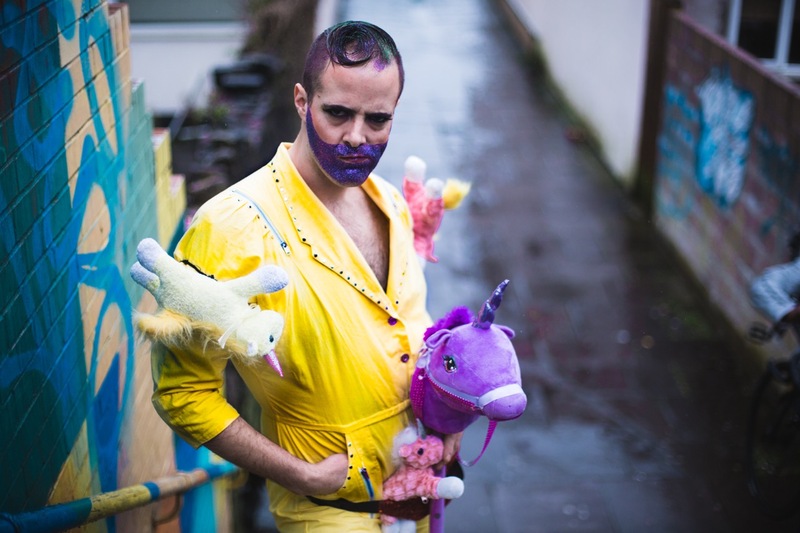 Last year Ernie and I created a ‘one man show’ for Made in Roath called ‘The Fabulous Unicorn Inquiry’ and it was a show exploring fabulous and whether it was a phenomenon limited to only unicorns. It was weird putting him and me on stage together but good fun! 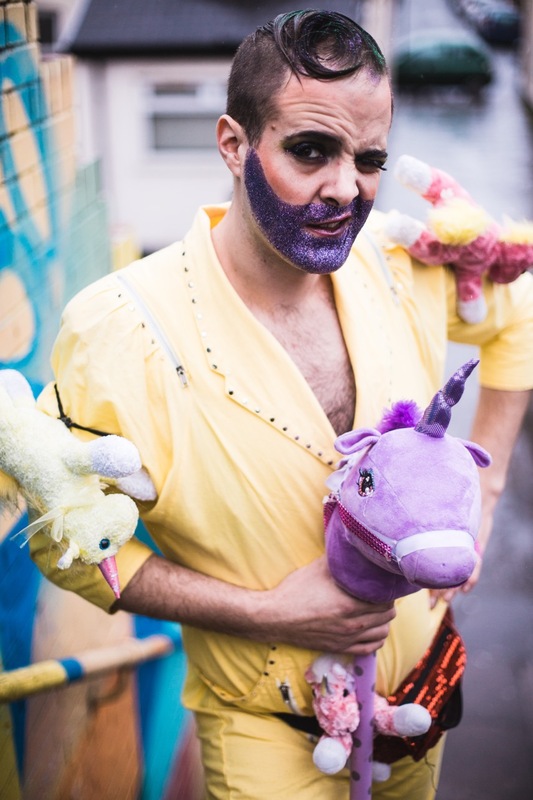 Recently he was followed by some student film makers creating a documentary about Boylesque – Sparkles The Movie we like to call it! I’m looking forward to seeing how that turns out! I don’t know why but I always refer to him as a different person! I mean, he’s clearly me but then me and him are so different! I guess it just helps me to define him as a character if I do – he’s just an exaggerated version of me I guess but I couldn’t live my everyday life like that – people would think I’ve gone mad! Maybe I already have?! So you want to know about my plans and ambitions for the future? NO! I promised myself to live every day for itself and not plan! I have dreams and hopes, and then I have realistic ambitions and plans! I guess I want to carry on developing and building my profile as a designer, model maker, theatre maker and make enough out of that to live happily ever after! A tough one I think, but I’ve been freelance now for nearly seven months and I’m still alive! I wouldn’t go back to a full-time job like before, na-uh, not ever! Obviously, I’d like to build Ernie’s profile too, and this year we’re getting him into some good gigs in some respected cabarets and burlesque shows. Although I’ve got a history of performance, Ernie is relatively new and so he’s still trying to find his feet and define himself! Yes, we make mistakes but mistakes are proof that we are trying, we need them to learn and grow from and that’s the fun of living! I have friends pass away too soon in jobs they weren’t happy in, I don’t want to be like that, I promised myself that wouldn’t be me. I want to love what I do, and the moment I don’t is the moment I find something else. I do know that I am lucky enough to be able to be able to live like that though, I am lucky and thankful for it. I guess in the future you could possibly see more of Ernie on the performance scene here, more Scratch This Cabarets and eventually some other shows. You can see Sparkles Hoop Troupe continuing to grow and delighting audiences. You may one day also see more of my design work – but sadly I don’t think I’ll ever be the one that makes the barricade! We are so lucky to have so many creative people in Cardiff. We’ve so many good things here across many genres. 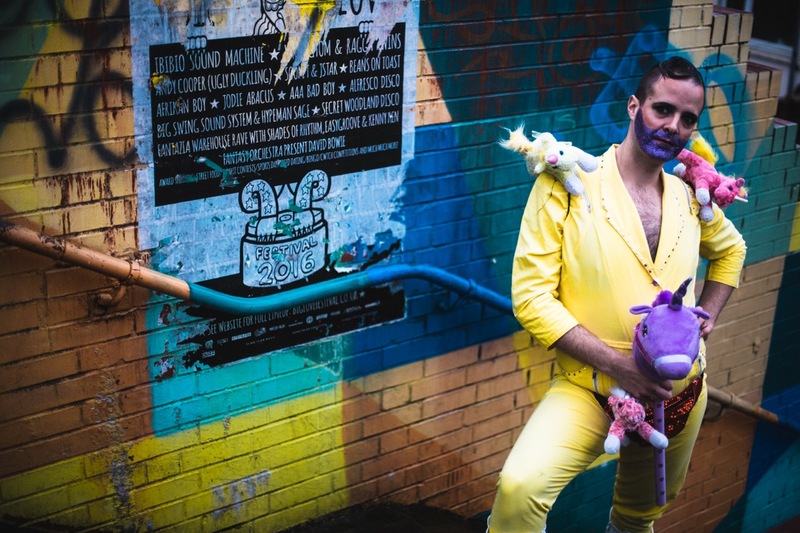 On the cabaret scene, we have Mary Bijou Cabaret and Social Club for circus cabaret, Cardiff Cabaret Club which is burlesque, and of course Scratch This which covers anything and everything! I’m sure there are more that I haven’t seen yet. It would be lovely if there was a regular cabaret bar or something but the frequency of these shows now means they really are something to look forward to! I think the biggest shame however is the loss of the Blysh festival, that was an awesome festival and it’d be great if we could have it back! Cardiff’s art scene is incredible, it really is! Having lived in London for so long, I was spoilt by the arts scene and what was on offer, but it was expensive and exhausting. The arts scene here is so much more relaxed and enjoyable – I guess there are several factors – it’s a smaller city so there’s more of a community feel, creative people here are looking out for each other, people in Cardiff are generally very supportive and encouraging – and that really is magic! There are so many artists and performers here that work hard to create some incredible work. This last year I have seen some incredible stuff come out of the city across many genres. It’s also relatively easy to create opportunities here, and that’s wonderful. I speak generally here, I mean I’m not naïve enough to believe it’s perfect, like everything there are politics and crap, but then everything has those aspects and we just must learn to get on with it and stay true to ourselves. I believe Cardiff’s art scene is ace and I think we should be proud of our arts scene here. My perfect Cardiff weekend for visitors would depend on who was coming and what was on! One of my favourite ‘touristy’ places in Cardiff is St Fagans – just because it’s probably the cutest place in the whole world! I also absolutely love the waterfalls in Brecon – Pontneddfechan, Sgwyd Eira is just the most empowering and majestic place – especially after a heavy downfall – it’s incredible! If we were staying in the city, then I would take them for a coffee at one of the coffee shops like Penylan Pantry, or Barkers. Afterwards to a show – at one of our many theatre venues followed by lots of lovely beer in Porters, or Brewdog, followed by some live music down at Gwdihw. The last group of friends that came to stay with me had to come and watch my last Scratch This cabaret. They loved it! ‘The Cruel Streets Revisited’ is the latest book by ex Detective John F Wake and focusses mostly on Victorian and Edwardian crime and characters in Cardiff. On the 28th March, 2017 at 2pm the author will be giving a presentation on the Cruel Streets at the Glamorgan Archive (opposite Cardiff City Stadium) and seats (free) can be reserved at http://glamarchives.gov.uk/. One of the characters featured in the book, Minnie Maguire, is now the subject of a theatre piece entitled ‘Virago’ and is destined for a week’s run at this years Edinburgh Festival Fringe.